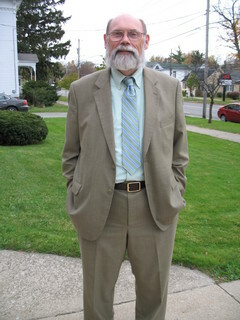 In 1995, after over two decades of practicing law in Central New York, Jim Barnes accepted the call to the pulpit, beginning his ministry serving UM churches in Jordanville and VanHornesville (southern Herkimer County). He came to the North Country seven years later when appointed to serve Grace UMC in Massena and the Hogansburg UMC. He was appointed pastor in July of 2007. Rev. Barnes was educated at Binghamton University, The University of Illinois College of Law, and Wesley Theological Seminary in Washington, DC. During his adult life he has also worked as an interpreter at the Farmers Museum in Cooperstown, a substitute teacher, and several years ago as a color commentator on radio broadcasts of football and basketball games. He and his wife Marge celebrated their 25th wedding anniversary in January of 2011. They live in the parsonage along with their son Adam. Two older children and six grandchildren live in Central New York. In addition to serving our congregation Rev.Barnes is the coordinating pastor of the West Stockholm UMC and Co-chair of the Upper New York Conference Commission on Archives and History. On the local level, he is on the Board of the St Lawrence County Historical Association and is President of Sandstone Housing which owns and operates the Mayfield Apartments. Rev. 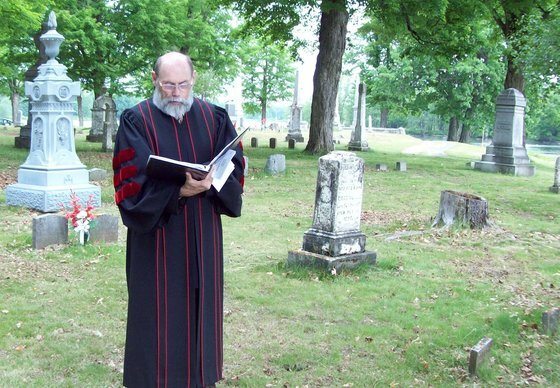 Barnes in Bayside Cemetery leading annual Memorial Day Weekend service honoring deceased Methodist pastors.